The company Glaub Solution has developed an application that allows robots to be operated more easily than ever before – theoretically from the convenience of your sofa. The company Glaub Solution has developed an app for controlling robots. There are countless apps for smart phones or tablet computers intended to make everyday life easier or more entertaining. There's a weather app, a spirit level app, an app for recognising songs based on a few sample notes, or one that will even generate its own songs if you merely say a sentence into your smart phone. In addition to this varied assortment of application software for private use, there is now an app intended to make working with machinery much easier. The company Firma Glaub Solution, based in Salzgitter, Germany, has developed and dubbed it "Eco/Soft". After all, professional applications have the same objective as private apps. Matthias Fleischer, who helped develop the app, explains: "It makes the operator's work more enjoyable." How does it work? In the past, most machines have been operated via a control device that is quite large. Each machine has such a device – they tend to vary depending upon the model, thus the employees end up having to be familiar with many different systems. By contrast, there is now an app that can be operated via an iPad or smart phone. Fleischer says: "Almost everyone has a smart phone these days and is very adept at using them. As a result, working with them has become very intuitive." This could reduce the training costs for employees, Fleischer says. There is yet another advantage, according to the developer: "Control devices for some industrial machinery can have delivery times of 6 to 8 weeks." A tablet PC can be purchased at any electronics store. The app was developed in cooperation with Bosch-Rexroth for manufacturing plants in which there is reloading of products, where there is movement involved. Glaub Automation & Engineering has spun off this line of business into a newly-established company, Glaub Solution GmbH. Niko Glaub, Managing Director of both companies, says: "The app enables you to leapfrog over the programming language." From the office to the production floor, it allows for standardised software. Glaub calls it "Büro 4.0" (Office 4.0). Different parts of the company will grow closer together. Fleischer emphasises: "It means that employees can solve problems using the device itself, without having to call in a specialist with knowledge in programming language." For three years now, the company has been involved in apps for the industrial environment. 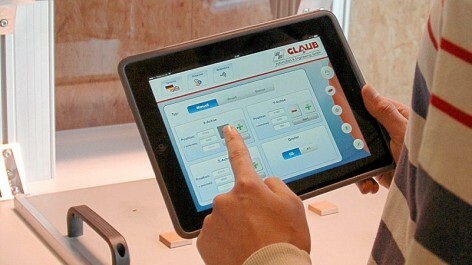 Glaub says: "We wanted to also operate devices at work the way we use them at home." The machine data, Glaub adds, can be called up from a mobile device. "Even when you're on holiday, you can see whether a machine has broken down – and address the problem immediately." If that is indeed what you wish to do. The company's vision for the future is that machines will not need human intervention for each step, rather they will communicate with one another and optimise themselves. A machine could signal that it has free capacity, for example, and commence production. There is still a significant obstacle for the introduction, however: Wireless Internet connectivity is not available on every production line. It is naturally indispensable for using the app, however.